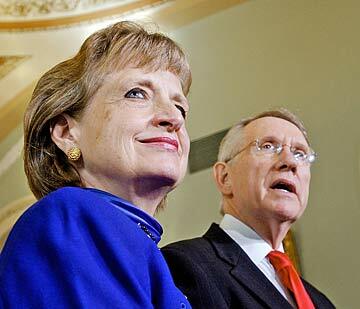 President Bush has nominated White House Counsel Harriet E. Miers to replace Sandra Day O'Connor on the Supreme Court. SOME conservatives are rankled about President Bush's choice to replace retiring Justice Sandra Day O'Connor, but their concern is based not on what they know about Harriet E. Miers but what they don't know. Bush has avoided the battle that the Republican Party's core had prepared to fight, and the strategy could lead to a fairly smooth confirmation. The dismay reflects a peculiar distrust of the president by hardline conservatives who relied upon Bush to turn the court to the right by replacing O'Connor, a moderate swing vote, by one of their own. Miers may be in the mold of Justices Antonin Scalia and Clarence Thomas, the constitutional originalists that Bush had said are his favorites on the court, and he promised during his 2004 campaign to appoint like-minded justices. Miers and Reid: House Minority leader Harry Reid praised Miers, whose nomination to the high court worries some conservatives. Bush may be the only person who knows of the approach to the law favored by Miers, appropriately described as a stealth nominee. After trailblazing for women in the legal profession in Texas, she was Bush's personal lawyer while he was governor and has served as assistant, staff secretary, deputy chief of staff and White House counsel during his presidency. Miers is known to have avidly supported him in the confines of the White House on issues such as tax cuts, Social Security reform and restricting federal spending on embryonic stem-cell research. Her lack of experience on the bench means she has left no paper trail to pursue during her Judiciary Committee hearings. Attorney-client privilege will keep her White House writings from reaching Capitol Hill. While tens of thousands of pages of documents authored by Chief Justice John Roberts were sent to the committee during his confirmation hearings, the members will be working from scratch at Miers' hearings. Twenty-two Democrats, including Senators Inouye and Akaka, voted against Roberts because of unanswered questions about his judicial philosophy, and they probably will learn less about Miers. Bush pointed out that 36 justices, including William Rehnquist and Byron White, had no experience as judges before being confirmed to the high court. Like Miers, Rehnquist had served in the administration of the president who nominated him. Senate Democratic Leader Harry Reid, who opposed Roberts' confirmation and suggested Bush consider nominating Miers, praised the choice. Sen. Charles Schumer, D-N.Y., who also voted against Roberts, says Miers has a potential to be a consensus candidate for the judicial post, but only if she answers his questions with what he wants to hear. Those reactions may have upset conservatives, who had wanted Bush to appoint a person with a strong record of judicial conservatism. Bush has called Miers "a pit bull in size 6 shoes," although she is known to be reserved and focused more on process and detail than on legal philosophy. "I know her heart," Bush said in nominating her. "I know her character." He also may know her opinions on such issues as abortion rights and affirmative action, but those may be confidential until the issues reach her as a Supreme Court justice.